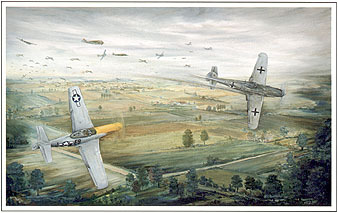 The Luck of the Draw is a unique and historically accurate WWII aviation print depicting a dogfight between two skilled pilots during Operation Market Garden. Each print is numbered and signed by P-51 Pilot Lt. William R. Beyer, Lt. John Lowden, and the Artist Marlin Troutman. This fine-art aviation print is presented on heavy-weight, 100%-rag, acid free stock. Image Size: 32 x 19.5, Overall Size: 36 x 25. You also receive an informational sheet that includes pilot bios, print number, information on Operation Market-Garden, and a detailed account of this moment in time from the P-51 fighter pilot Lt. Beyer. Purchase with confidence use PayPal or Your Credit Card through PayPal. Please Contact Us Shipping prices for Alaska, Hawaii and International Orders. Shipping & Handling: $17.95 FREE SHIPPING through Fathers Day! * Free Standard Shipping for orders from the lower contiguous 48 states. Please Contact Us about expedited shipping and shipping costs for Alaska, Hawaii and International.